1. Expansion of functions: stop, pause, resume, fans, low light, external relay. 2. Fit for DIY desktop laser engraver,dispensing machines printer,plotter,tool CNC. 3. 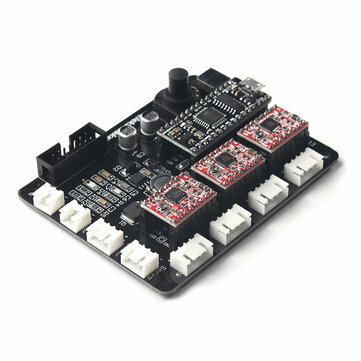 Three axis linkage, Y-axis dual interface, can drive a stepper motor within 2A 2-phase 4-wire. 4. Micro USB interfaces, 12V power supply, delivery lines! Send software! Technical support! 5. Large MOS tube, onboard DC buck module, wire jump ADJ can adjust manually the laser voltage to control the laser power. 1. There isn't Voltage Regulator Module in this Laser board. 2. The motor can not work hight than 2A, when the motor work for a long time in 1A to 2A , please pay attention to heat.